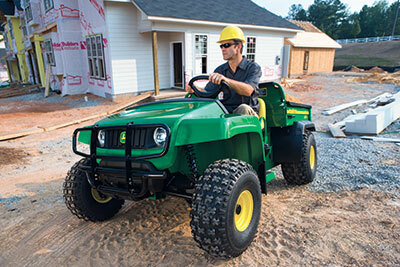 How UTVs and attachments are changing the job site. Ready for work or play, utility vehicles (UTVs) are gaining traction as landscapers find more applications for them on the job site. These machines are now starting to fill voids in some landscapers’ fleets—and not just on the commercial side. Helping to make them an attractive, versatile option is a long list of attachments. Some of the most popular ones are sprayers, hitches, tool racks, cabs, plows and mowers. There are options for a variety of tasks, whether a professional is looking for a better way to transport crews and tools across a site or manage snow and ice on a customer’s property. With more manufacturers entering the UTV arena, landscapers have even more options to consider if they decide to add this type of machine to their fleets. It’s not just about what the vehicle can offer but how a professional can get the most from it. To get a better idea of how some contractors are putting them to work, take a look at why the following landscapers chose UTVs and what the current sales market looks like for these machines. Maximizing a crew’s efficiency is a top goal for any landscaping company,especially when it comes to finding the best way to maintain a large property that requires a variety of services. 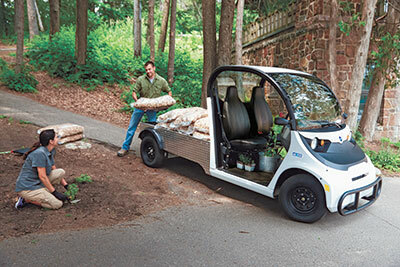 UTVs can help with transportation, hauling tools and speeding up tasks, which are some of the reasons Level Green Landscaping added the machine to its fleet, says Michael Mayberry, chief technical officer. Located in Upper Marlboro, Md., Level Green provides commercial landscape maintenance services, including enhancements, design/build, snow and ice management and irrigation management throughout Washington D.C., Maryland and Northern Virginia. With an annual revenue of $15.7 million, the company serves properties like HOAs, condos, mixed-use facilities, retail, institutions and office buildings. Though the first half of 2017 has shown promise, UTV sales were down in 2016. Level Green uses a John Deere UTV for maintenance on one of its properties, the Franciscan Monastery, which spans nearly 50 acres. The site includes a church, public gardens, courtyard, greenhouse, parking lots, a private park and other features. With such a vast space and list of tasks, the UTV helps transport the maintenance crew and its materials, saving time and some of the strains of labor. The company also uses a UTV to hold a spray tank when applying chemicals on plants or to treat weeds along curbs. During the winter, the Level Green team uses the UTV with a snow plow and brine sprayer to tackle sidewalks at shopping centers and other properties. “It’s got an enclosed cab, so it keeps people warm,” Mayberry says. One of the main advantages to using a UTV is its versatility because of a long list of compatible attachments—from mowers to snow plows. Before making a purchase, Mayberry encourages landscapers to demo the UTV first and talk to the distributor and sales reps to learn more about their options. It’s important for pros to make sure specs like towing weight, hauling capacity, lift options and other features meet their needs before deciding on a model, as well. Beyond reviewing the machine’s capabilities, landscapers should also consider if and how this vehicle could fit into their businesses: What will be its main use? How can they get more from the machine? Mayberry says Level Green is open to buying more work vehicles in the future, but the company is considering how much it wants to scale up and if a new machine fits in that plan. While UTVs aren’t as prevalent in the landscaping industry as in some others they may be gaining some ground as professionals figure out the best ways to utilize them. He predicts the demand for UTVs will grow with landscapers as manufacturers continue to improve technology and add more attachments. Not all operators cater exclusively to commercial clients with UTVs, however. There are also some professionals who have found applications for this vehicle on the residential side. Victor Scalici, owner of Scalici Farm & Greenhouse in Freehold N.J., uses his UTV on the job site and with his family. His company offers lawn maintenance, landscaping, paver installation, drainage work and snow removal services, and it also has a garden center. The company mainly serves high-end residential clients, in addition to properties like churches. Scalici originally decided to purchase the machine for his farm because it was easier for his wife to get in and out of, compared to other types of equipment. But now, it’s a workhorse for all his landscape and snow removal work. Scalici has been using a Bobcat Toolcat for more than 15 years, trading them in every three to four years for a newer model. He uses the machine year-round with attachments like a mower, fork, tree spade, small milling machine, sweeper and snow plow. It’s especially useful during the winter months when he’s going house to house for snow removal, he adds. Through the years, the dashboard and controls haven’t changed much, Scalici says. He says every time he trades in, the machines are stronger with more updates than their predecessors, as is to be expected. But something he wishes would be altered on these machines are the control placements, which can pose problems when operators treat them like they would a car—for example, accidently throwing the vehicle in reverse when they think they are grabbing the blinker. Scalici says that’s something he’s seen and experienced and would prefer the machines had a forward/reverse button instead like some of the newer models of equipment. For the most part, the overall UTV market was down in 2016, says Greg Boeder, senior partner at Power Products Marketing, a powersports and outdoor power market research company. “Sales of what we call pure UTVs—the speed-limited vehicles most often found in landscaping applications—were down 7 percent, while utility crossover UTVs used in both utility and recreation were up 13 percent,” Boeder says. The electric UTV market was also up 10 percent, he says, and the sport UTV market was down, pulling the overall market down to essentially a flat year. However, the research firm estimates the U.S. UTV market through May 2017 was up. That upward trend could continue for several years, the firm says. While last year wasn’t a strong one, side-by-side UTVs have seen their sales go up through the decades in the U.S., primarily for commercial use, going from about 100,000 units in 2000 to more than 400,000 in 2015, according to Power Products Marketing. With more players in the UTV mix, landscapers can expect to see additional features, sizes and capabilities, giving them more options for their businesses.